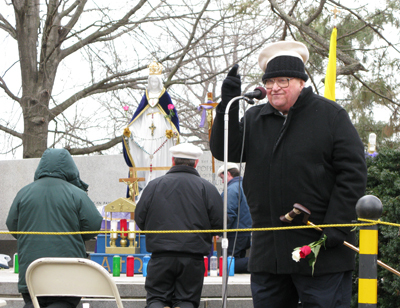 James Donohue (r.), our new Vigil Coordinator, leading the prayers. 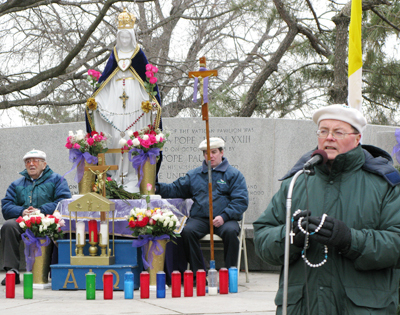 Despite the cold, blustery day with temperatures in the 30s, about 80 warm-hearted pilgrims attended. "The prayers that you have conducted for the priesthood on the Sundays of your years upon earth shall be counted at the time when all of you shall go over the veil. Then you will rejoice with all Heaven for the number of priestly souls that you have brought back to the fold." Our Lady, Sept. 27, 1986. 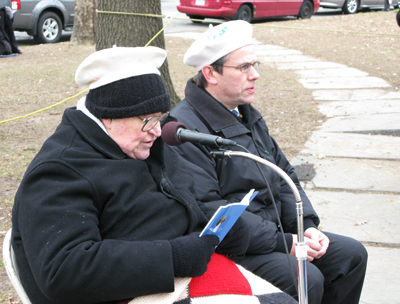 Lay Order of St Michael (LOSM), front and center inside the rope ( l. to r.): James Donohue; Michael Mangan, kneeling; Peter Frank, at the microphone praying the Litany of the Holy Trinity; Darryl Bolisay, just behind Mr. Frank, and Bill Dykes. As you know, LOSM is a celibate community who work full-time promoting the Message from Heaven. 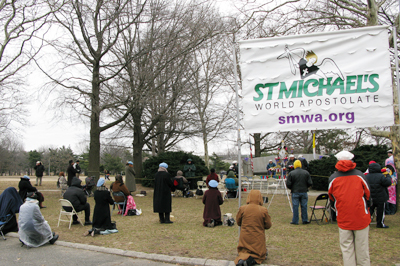 Our Lady said that LOSM will give birth to the Order of St. Michael, a religious community of priests, brothers and laity that "will be established in the United States" (May 22, 1974) and "will go forward throughout your country and the world" (June 18, 1974). Fr. Skurla giving his priestly blessing to close the Holy Hour. We urge you to join us in person for these very important Holy Hours every Sunday.